Publisher / Place of Publication: Wicklow County Council / County Buildings, Wicklow Town, County Wicklow. About: Perhaps Halloween is an appropriate occasion on which to showcase this publication. Gravestones have obvious genealogical value but in this book the author highlights the artistic quality and the social and religious background to the creation of headstones in 18th century Wicklow. Many of the examples shown are located in the southern and western half of the county. This book was published by the Heritage Office of Wicklow County Council as one of the outcomes of the County Wicklow Heritage Plan. It is lavishly illustrated with colour photographs in an A4 landscape format. Chapters: Preface — Introduction — The Purple Slate Headstones — The Aughrim School of Granite — Denis Cullen of Monaseed – The Glendalough Mason — The Blue Slate Headstones — Stone Masons at the Turn of the 19th Century — Notes — Further Reading — Indexes. When Viewed: Contents described are those showing when viewed in September 2014. 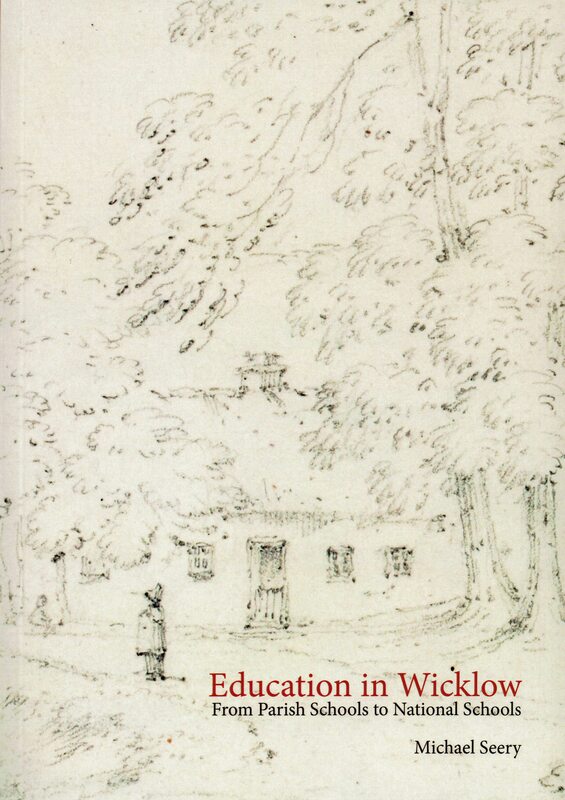 About: A meticulously researched and well-presented work which traces the history of purpose-built schoolhouses in Wicklow up to around the middle of the nineteenth-century. Written by someone who has an obvious passion both for education and for local history, it is hard to believe that a book of this size could contain so much information. Chapters: [Introduction] Education in Ireland – Penal Laws – The lay of the land – Sources for this study – Overview of book. [Education in Ireland before and under the Penal Laws] Royal schools – Charter schools – Other schools. [Landlord educators and the Wicklow Education Society] The Kildare Place Society — The Wicklow Education Society – The Fitzwilliam Estate – Arklow Barony – Talbotstown Barony – North-east Wicklow – Conclusion. [The emergence of a National School system] The decline of the Kildare Place Society – National Schools in County Wicklow — Conclusions. [Appendices] Extracts from the reports of the Kildare Place Society training records for Wicklow (1814-1825) — Extracts from the records of the Kildare Place Society: gratuities awarded to teachers to 1824 — Extracts from the Lord Lieutenant’s Fund for County Wicklow – Wicklow returns to the Second Report of the Commissioners of Irish Education Inquiry (abridged) – Brief biographical details of those with an interest in Wicklow education – Schools marked on Ordnance Survey of Ireland Map (1838-1840), with web link to OSI map, Google Map, Google image (where school building is still in existence) and notes on the location of school – Bibliography – Endnotes. Extra #1: Includes several black & white photographs, maps, plans and tables of data. STOP PRESS: The author’s website (viewed March 2015) states: “Education in Wicklow is now sold out but is available for free on Google Books.” Click here for Google Books link. About: The metrics of the West Wicklow Bookshelf Blog have indicated several internet searches for the words ‘Kilranelagh poem’. In response, we have transcribed the text of this poem and made it available to read online. Hopefully this is the poem which is sought by the searcher(s). Extra #1: Read the poem here. Extra #2: Check Libraries Ireland for the publication containing this poem. Extra #3: Check OCLC WorldCat.org for the publication containing this poem in libraries worldwide. When Viewed: Contents correct as of September 2013. About: The Census returns for the Eadestown District Electoral Division arranged alphabetically by townland. The 1901 census was taken on 31st March 1901. The 1911 census was taken on 2nd April 1911. About: A statistical return of the extent of townlands and towns, their Poor Law valuation, the number of males/females and the number of houses in County Wicklow. The number of persons and houses for 1841 are included for comparison purposes. This allows for a quick check on the effect that the Great Famine had on the demographics of West Wicklow. Extra #1: Read this publication online (pdf file) courtesy of the Enhanced Parliamentary Papers on Ireland website. Hat-Tip: Thanks to the EPPI website which contains a complete set of British Parliamentary Papers relating to Ireland and Irish affairs published during the period of the Act of Union (1801-1922).